I love to play around with recipes for eggplant that don’t involve breaded and deep fried slices layered with cheese. Not that classic eggplant parmesan isn’t absolutely delicious, it’s just way too loaded with calories for me to enjoy without feeling completely guilty afterward. The problem with eggplant is that it is basically a sponge for whatever liquid you submerge it in. When deep-fried, slices become oil soaked on the inside and crispy on the outside – again, absolutely delicious but way too high in calories to enjoy on a weeknight. When eggplant is submerged in just about any other liquid, it tends to lose its structure and breakdown into a gooey mush. One way I’ve learned to try to combat this problem is to roast slices of eggplant on a baking sheet before incorporating them into a dish. My Lighter Eggplant Rollatini showcases this method perfectly. It’s a great weeknight meal to make when you’re craving comfort food but can’t afford the extra calories. This recipe is hearty enough to stand on it’s own for a meal, or pairs perfectly with some whole-wheat pasta on the side. Spray two foil or parchment lined baking sheets with olive oil spray. Cut the eggplants lengthwise, into ½ inch slices. Arrange the slices on the baking sheets. Spray the slice with a bit more olive oil and sprinkle with kosher salt. Bake for 30 minutes, flipping the slices once after 15 minutes. While the eggplant is baking prepare the filling. Place the spinach in a glass bowl, cover (I use a dinner plate as a lid), and microwave for 5 minutes until spinach is wilted. Stir in ½ teaspoon salt. In a food processor combine the beans, garlic, ½ teaspoon salt, and fresh ground pepper. Pulse until smooth adding a couple tablespoons of water if necessary to form a thick puree. Remove the eggplant slices from the oven. To assemble the rolls spread a bit of the bean puree on one half of each slice. Top the bean spread with some spinach and a sprinkle of parmesan. Starting from the end with the filling, roll up tightly. Spoon half of the tomato sauce into a shallow baking dish. Place the rolls into the dish seam side down. Top with the remaining sauce. Bake uncovered for 25 minutes. Sprinkle on a bit more parmesan before serving. Enjoy! Spray a medium saucepan with olive oil. Sauté the onion with ½ teaspoon of salt over medium heat until the onion becomes translucent, approximately 5 minutes. Add the garlic and sauté for an additional minute. Add the tomatoes and black pepper, stir well and cover. Allow to simmer for 15 minutes, stirring occasionally to prevent the bottom from burning. Remove from heat and stir in the fresh parsley. Taste and add additional salt if necessary. I found you by way of foodgawker and this looks delicious! I'll definitely try it soon; thanks for the recipe and I'll be sure to check out your others. I used to hate eggplant (like many others) because the whack way the people around me cooked it. Then, my roomate introduced me to eggplant parmesan (breaded and deep fried slices layered with cheese) and I fell in-love and converted a bunch of other people as well.. =). 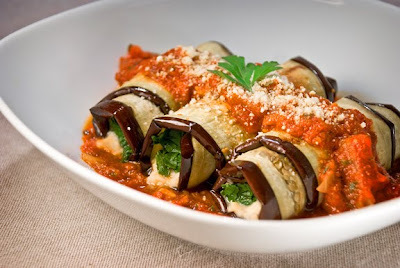 I can't wait to try lighter eggplant rollatini recipe next time my fiance+fam come over. Please post more delicious pictures in your recipes as well !! Mel, eggplant is something I have always been afraid to make ... just not sure how to cook it, but you've given me the courage to want to try & make it with your step by step instructions. I wrote this on FB, but have to say it again, that eggplant is so pretty! Thanks for always sharing your recipes. It's my most favorite blog! My boyfriend and I made this recipe last night and were so pleased with the yummy result. Thanks for taking a calorie-laden recipe and making it a healthy weeknight choice! this recipe sounds great. I like eggplant, but, my finances don't let me grocery shop often. I really would like to find healthier foods for me that aren't so exspensive. I applaud you Ava. I used to be a chef, and I am thrilled to see a young woman with such a knowledgeable interest in food. You know what you're doing, and I hope you keep it up. I added your blog to my 'favorites' list, and that is rare for me. Thanks Nancy! So glad you enjoyed this recipe! This recipe looked AMAZING and I was so excited. I used a little less spinach than required (maybe that was the problem?). We don't use too much salt typically and 1 tsp certainly doesn't sound like a lot, but we had to throw out our dinner. I will try again with no salt. I think my salt problem was kosher vs. table. Round 2: Delicious! Added prosciutto. Will definitely make this again.